One of our clients just got promoted to VP in his organization because he was able to meaningfully shift his behavior and perception. He turned his perception around by understanding and managing his impact in the room. He authentically learned how to demonstrate consistent, mature engagement and emotional competence and control in all his interactions. Congratulations! There is considerable discussion and research about how to to attract more women into STEM (science, technology, engineering, and mathematics) fields. Harvard Business Review article by Laura Sherbin looked instead at the attributes of women who are successful leaders in the STEM professions. The six characteristics for success strongly align with the C.L.E.A.R.L.I. attributes of authentic executive presence from our book, “Seeing Yourself as Others Do – Authentic Executive Presence at Any Stage of Your Career” (SYAOD). In the mid-1980’s I led a very high-performing computer Systems and Programing team that accomplished what many in the industry thought was not possible. The relevance to this topic is that half of my team was female. Three of my six directors, and 50% of the programmer analysts, were women. My experience is directly aligned with what Sherbin has identified in her article on successful STEM leaders who are women. Her article is based on a nationally representative survey of 3,212 women with STEM credentials. 1. Telegraph confidence. The subtle and not so subtle message that men are better at STEM fields has intimidated and discouraged many women. The successful leaders were seen as less likely to be buying into that myth. They demonstrated what we refer to in our SYAOD book as “Command of the Room with Charisma“. 2. Claim credit for your ideas. Successful leaders are more likely to speak up compared to the 82% of women in STEM who feel their contributions are ignored. Regardless of the environment or gender, it is important to be wise about when and how you express your ideas. We have a video, “What to do when someone steals your idea” in our 23 Mundane Moments series that addresses this topic. It is important to show enthusiasm when delivering a clear and concise message. Otherwise, it can get lost today and picked up next week by someone else. 3. Invest in peer networks. Sherbin points out the importance of building relationships that increase trust and influence. There is some risk in advocating for others in the organization. There is also benefit in taking those risks. Those who built networks often experienced support from others when they really needed it. 4. Build up protégés. Investing time in helping others may seem altruistic and it probably is. There are, however, direct benefits. Those who did this were seen a builders of new leaders in the organization and seen in a very positive light. 5. Be authentic. It is much less stressful at work when people feel they can be themselves. The more successful women STEM leaders were more likely to say they felt they could be themselves at work. We find “authentic” is important and often misunderstood. In fact, when selecting the title of our book, we added “authentic” to the “executive presence”. Being seen as authentic and feeling authentic are not the same. Both are important. 6. Hone your brand. The study found the successful female leaders went beyond their job title and description. They were active internally and externally. They supported affinity groups, attended conferences, did networking and helped people know them. One thing I liked about the results of the study is that success is mostly a choice. I have seen this be true among our many clients who fit the female STEM leader profile, and my experience running a systems and programming group. We have also had very positive feedback about how our book has helped people in technical roles be significantly more effective. You know I love the Rule of Three! 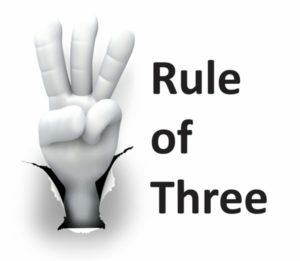 “The Rule of Three states things that come in threes are inherently more appealing than those that don’t. It is more memorable, humorous, satisfying, and effective than any other grouping. It is more likely to be remembered because having three items combines both brevity and rhythm with having the smallest amount of information to create a pattern. We can choose to be happier. If we are happier we will be healthier. 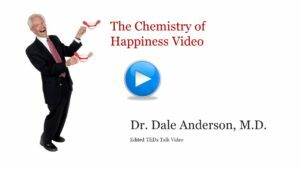 I want to share with you an edited version of a TEDx Talk on “The Chemistry of Happiness”, by Dr. Dale Anderson, M.D. Dale describes how, by acting as if we are happy, our internal pharmacy can change our body’s chemistry to make us actually feel happy. For over 50 years Dale Anderson, M.D., has practiced as a board certified surgeon and emergency physician. He is also certified by the American Board of Holistic Medicine. The video is entertaining and also contains wisdom that can improve your mood and your health.